Local church involvement is vital in assisting individuals and families affected by disaster. Disaster Response Ministry wants to help local churches understand how important they are as partners in this ministry. We would love to come talk to your group, class, or church and begin a partnership that will make a meaningful difference when disaster strikes. Walnut Ridge and Hoxie UMCs offered volunteer housing for teams such as this and office space for recovery services. In disaster response, the local church can provide early assistance. Your church has the opportunity to open its doors in a time of disaster by providing sanctuary, setting up a shelter, providing meals, serving as a relief supply drop site or distribution center, or addressing other community or response needs. A large role of the church is to provide emotional and spiritual care to those affected. Then, in long term recovery, when the church engages with the community in the recovery effort, the door is opened for the Conference and UMCOR to be able to offer support and resources to the community and those affected. Click here to learn more about how your Local Church can get involved. The Arkansas Conference offers three training opportunities for local churches to be better equipped to serve their communities and other communities in the aftermath of a disaster – Disaster 101, Connecting Neighbors (Local Church Preparedness) and Early Response Team. Click here to learn more about these trainings. 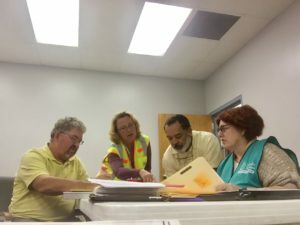 Local Church Coordination Team – This Team takes the lead in helping individuals and families within the church to be prepared, making recommendations on how the church can be better prepared, engaging the church in community preparedness and response, and organizing volunteers from the local church to respond when disaster strikes. The Team is the operational response team of the church. The Team also sets policy and monitors progress as it supervises and supports response operations. Composed of: Local Church Disaster Response Coordinator, Trustee, Treasurer, Communications Director, Outreach/Mission Coordinator, and other volunteers according to the role(s) the church will play in response. 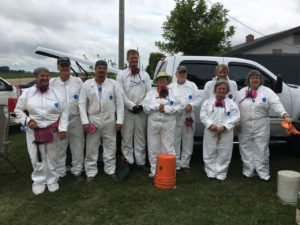 Early Response Team (ERT) – The mission of the ERT is to provide a caring Christian presence in the aftermath of disaster. ERTs respond in the relief phase of disaster to offer services to prevent further harm such as tarping damaged roofs, clearing debris, cleaning out damaged homes, packing out furnishings and personal belongings. A deployed team consists of 7-14 specially trained and badged volunteers. Team members re-certify every three years within the year their badge expires. Early Response volunteers have opportunities in continuing education through advanced training. Connecting Neighbors is a program that gives congregations the tools and information they need to guide the development of their disaster-response ministries. Congregations that invest their time in Connecting Neighbors training are better prepared for emergencies when they happen, able to draw on local resources more quickly in the wake of a disaster and more confident that United Methodists will be a resource for community recovery. We know churches can better provide a caring Christian response to local disasters if they have prepared their church families and facility before disaster occurs. Connecting Neighbors addresses the faith community’s responsibility in disaster readiness and response and suggests tools to meet individual and community needs. 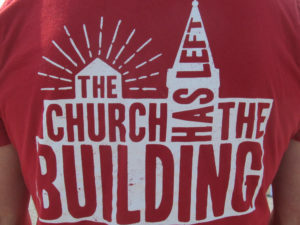 In this training you will be taught the Connecting Neighbors program, how to connect the church to outside resources and to the community’s emergency plans; where the church fits in and how the church can help the community at large. Click here to learn more about Connecting Neighbors training. Organize a supply drive and put together UMCOR relief kits. Be prepared to store the kits or ship them to UMCOR if the timing is not such that they can be brought to Ingathering and if they have not been requested in response to a disaster event. Click here to see how. Arkansas Conference keeps a small start up stock of kits and supplies. This stock is used until more can be requested and recieved from Sager Brown. That stock, if not used, is rotated out each year at Ingathering. The only time we accept kits or supplies is during a response to a disaster event when supplies are needed/requested and at Ingathering each year. The Arkansas Food Bank IS NOT a drop site or a storage facility for supplies. Please do not take kits or supplies to the Food Bank. More detailed information on all in-kind donations and the Arkansas Conference policy will be available soon. Community Organizations Active in Disaster (COAD) Development – Help your community to be better prepared when disaster strikes. Find out if there are any joint efforts in the community among churches, civic clubs, food banks, thrift stores and other organizations and agencies who have resources to offer when disaster strikes. If so, be sure your church is a part of this effort and let them know what your church, the Arkansas Conference and UMCOR can offer when disaster strikes. If not, see what your church can do to help develop a COAD. (Not to be confused with an LEPC, a Local Emergency Planning Committee which is a group of emergency responders.) It’s much better to organize efforts ahead of a disaster than to try to do so in the chaos after it strikes. Pocahontas FUMC offers office space for case management. They also offered space for the Volunteer Reception Center and continue to offer meeting space for the Long Term Recovery Group. Long Term Recovery Group (LTRG) Development – When disaster relief efforts wind down, recovery efforts begin. No one knows a community better than the residents of that community. You know the people of the community, the facilities in the community and the resources the community might have. A Long Term Recovery Group of representatives of local organizations and agencies forms to oversee the recovery operation after a disaster. Relationships with Partner Organizations and Government Agencies – Get to know the other players in response in your community and help them get to know you and what you have to offer when disaster strikes. A trusted partner is invaluable in the efforts of preparedness and response. Develop these relationships before disaster strikes. Your Conference Disaster Response Coordinator is available to give consult and direction and walk alongside in any and all of these. When disaster strikes, the question is asked – Where is UMCOR? United Methodists are UMCOR. Your church is UMCOR. If you and your church aren’t there, UMCOR isn’t there. Steve Taylor of the North Carolina Conference said it really well in a piece he wrote in the aftermath of Hurricane Florence: “Thus, to the question, where is UMCOR? The answer is no further than our local church. We are UMCOR. This is why it is so incredibly important to participate in Connecting Neighbors training, ERT training, get our green t-shirt and get out into our communities, helping where we can, praying with all who need it, and being the hands and feet of Christ.” Your church can help support Disaster Response Ministries by helping with recruitment, by promoting its efforts and by providing volunteers, teams, and funds.